Nice. The stars on the outer edge should be removed, though. They disturb the pattern as well as the echo of the inner edge pattern. Also, I think the 1 and the Δ are slightly too close and running into each other. One should not partially obstruct the view of the other. Pretty good, Frizio! The reflection of the lines of the 2 in the top lines of the helmet is pleasing. In fact, I like the 1 in that series a lot also, with motion created between the pillar and the 1. Excellent designing. 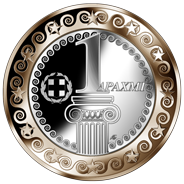 I think classic themes are somewhat overused on Greek coins. Ordinary Greeks feel more nostalgia towards the grandeur and stability of the Byzantine empire, which is quite relevant in the current crisis. 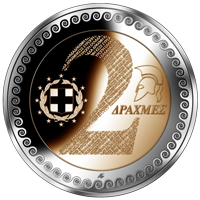 I like the one design, even with the stars, though if this is for the Drachma, I wouldn't bother. The 2 design I don't really like the way the 2 is done and the helmet seems to be just placed there for not much reason. Also the swirls on the outside don't look as good smaller as they do bigger.